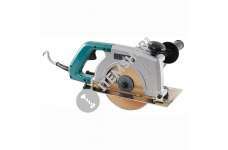 Makita 4107R Diamond Saw utilizes water to cool the grinding action​. The water prevents the tile from breaking or cracking under the extreme heat caused by friction. 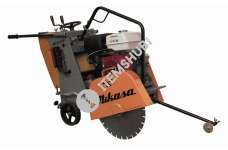 This is the reason you will..
Mikasa MCD-218 is a powerful and sturdy electric starter asphalt and concrete saw with manual drive, suitable for most commonly used repairs in asphalt and concrete. 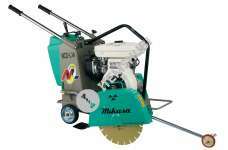 The depth adjustment is easy with ..
Mikasa concrete cutters have cutting range from 70mm to 170mm. Attachable blade sizes are from 10"(254mm) to 18"(457mm). Their various models are available to accommodate at any job site. 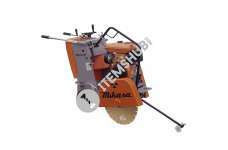 The compact ..
Mikasa MCDL14 seam cutter used for cutting a wide variety of materials such as concrete, asphalt or other unbound surfaces, sowing cutters are an effective tool to accurately and accurately cut the co.. The machine is part of the professional equipment category and is equipped with a plastic water tank mounted in the upper part, to ensure a very good fall of the cooling water of the disc.Robust and r..